According to at least one source, Netflix has been conducting some very specific market research with regards to its Internet TV service being delivered on Sony’s PlayStation 3 and Microsoft’s XBox 360. Presuming the survey is real (the spelling of PS/3 looks a little suspect), it still isn’t proof that Netflix’s “Watch Now” service will be arriving on a next-generation games console anytime soon. Although the survey talks about inserting a “special Netflix disc” into the PS3, I’m pretty sure any such software would need to be sanctioned by Sony. The same applies to the XBox 360. This begs the question as to whether either company would want to enter into an agreement with Netflix. Microsoft already has a competing Internet TV service of its own with the XBox Live Marketplace, and Sony has hinted at launching something similar. However, Netflix on a games console is certainly an ambition. The company’s founder and CEO reiterated as much in a recent interview with the Wall Street Journal. Reed also talked down the issue of set-top box fatigue, the notion that consumers aren’t willing to shove another device under their television sets. 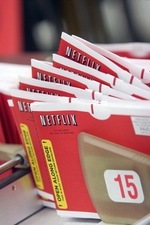 By putting Netflix onto a dedicated set-top box, along with existing devices such as the XBox 360, PS3 or next-gen DVD players, Reed seems determined to hedge his bets. Having said that, don’t dismiss the humble laptop. Echoing what Azureus CEO Gilles BianRosa told me last October with regards to Vuze, Netflix’s younger customers are perfectly comfortable with watching long form video on their PCs. I think it sounds like a good idea. If you already have a high-def dvd player that is hooked up to the internet or a game system that is as well, you can have dvds sent to it immediately.